The British Gazette » Brexit: Blocked by the EU Parliament? On Sunday 2nd April 2017, the Daily Express ran a piece by Alice Foster warning it’s readers that the European Parliament could block an EU exit deal and MEPs can veto the deal. Much has been said about Brexit since the historic vote on the 23rd June, 2016. 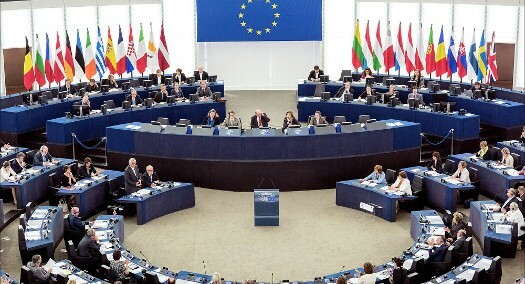 The involvement of the European Parliament however has not been given the attention it deserves. And the British Gazette is as guilty as many others in this regard. Since Midsummer’s Day 2016 the British Gazette has, when it has addressed the Brexit issue has essentially pursued one line: to try and ascertain and also to speculate upon the strategy Her Majesty’s Government is employing. And to put it bluntly, we are little further forward today than we were a year ago on Tuesday 4th October 2016. What the British Gazette, along with other publications have been doing is to postulate a series of hypotheses. All hypotheses must start with one or more assumptions. For the British Gazette these have tended to focus on the “fool” or “fraud” question; is the Prime Minister a fool or a fraud? For the purposes of the hypothesis the two are mutually exclusive – she is either one or the other, not both. This is because the negotiating strategy employed so far appears to be leading the country over the cliff of a hard Brexit. At this point, logic is employed. Since this will be catastrophic in terms of disruption to trade and the economy, it is presumed that Madame is sane and therefore wishes to avoid this, or is a fool and does not believe that a hard Brexit will result in such. At this point, some commentators embark upon conspiracy theories: One such conspiracy theory goes like this: A “hard Brexit” will result in a huge crash in Sterling, the stock market and property values – particularly in London. Thus the idea is to bring such about with the intention of being able to pick up all manner of assets at “fire sale” prices. Here the theory diverges into two scenarios: The first is that the Uk continues outside the EU and slowly recovers – over a decade – and that the conspirators sit on their assets and wait. Or secondly, that the economic and political situation will have become so dire, so quickly that a speedy resolution (emergency re-entry into the EU and entry into the Eurozone) will take place leading to a more rapid realisation of profit. Of course the conspirators would have to be aware that such a conspiracy would be illegal! They would also be aware that in recent years, British courts have begun – to avoid the US authorities demanding extradition of the suspects – in recent times to significantly increase the penalties they impose for the non violent offence of fraud involving significant sums. The example of the unfortunate Mr Hayes serves to illustrate this. Thus the conspirators will be running the risk of a custodial sentence in the order of twenty years. This would mean that they serve ten years. They would also be aware of the draconian provisions of “POCA”. “POCA” or Proceeds of Crime Act” fills wrongdoers with dread! It is a draconian statute! It’s purpose is to – and it does – relieve criminals of the proceeds of their crimes. It is very harsh. You Dear Reader acquire through your own purchase or say inheritance a rental property. A flat in a not very salubrious area of a city. You are unhappy at the prospect of a rental of £400 pcm and tenants that will have problems with their rent and also likely to be persistent in their complaints about the property leading to significant expenditure on maintenance. A dubious person you are occasionally acquainted with suggests a far more profitable set of tenants; “Escorts” aka prostitutes. He/she puts you in contact with two “working girls”. These two “personal service specialists” are desirous of a small flat near their customers. It is safer than working on the street and freed of a pimp they get to keep more of their earnings. They offer a rent of £1,200 pcm – three times the market level. You accept their offer with alacrity. After six months however the police raid the property and you are arrested for brothel keeping. You are convicted and find yourself in prison for 6 months having been given a 12 month sentence be3cause you have pleaded guilty and it is your first offence. Six months “porridge” however is the least of your problems. The CPS use POCA to confiscate your flat! Thus you not only loose the £7,200 rent, you loose the flat also! You emerge from prison a much poorer person! What can Madame Mayhem be up to? It might be the case that the European Parliament itself will insist of a “second referendum” to the deal. In this way it will not be the Tory party or the Labour party who will bear the opprobrium but the EU Parliament! If the Brexit deal – which can ONLY be a vote on the transitional arrangements now – is rejected by the British People we are placed in a situation worse than where we would have been had the vote on the 23rd June 2016 be for Remain. This is because the fig leaf that was not a fig leaf would have been enacted. It was very little but it would have been greater than zero. Furthermore the UK’s position and influence will have been gravely weakened and will be unable to resist the moves towards EU federalisation! THIS IS NOT GOING TO END WELL! Herewith a short ‘meditation’ on Brexit negotiations. C. S. Lewis once remarked that a corpse has the ability to repel any conceivable attitude one might adopt towards it. There is much talk and discussion on how we should achieve BREXIT, or finger pointing that this or that approach is wrong. There are indeed one or two well researched approaches that are both sensible and rational. But in all of this intelligent (and sometimes unintelligent) discussion, one voice is absent – that of the EU itself. Of course there are plenty of sounds from Brussels but they do not relate to us at all. We might as well be talking to a corpse. A friend of mine worked as a porter in a hospital morgue. He remembers how newcomers were asked to jack up a corpse to the storage fridge. As they pedalled the jack the corpse would jerk and emit disturbing ‘gasps’. The EU has no intention of ‘giving us a deal’, reasonable or otherwise; so, like the prophets of Baal in the contest on Mount Carmel, we can dance around and shout and ‘cut ourselves but the ‘heavens [Brussels] will remain as brass – unlistening and uninterested in our antics. Perhaps I exaggerate about there being no deal available; there is one they will accept: unconditional surrender. Maybe deep in the German psyche is a memory of how the Allies in WW2 insisted on unconditional surrender and refused to ‘make a deal’ [the Western Allies could not afford to fight the Russians]. ‘No deal’ is better than ‘unconditional surrender. The same EU parliament will have to vote to approve any “deal” if one is reached. Europe will play hardball and hope the deal they give is rejected also by our parliament and then we get entangled in a general election leading to another referendum. There is no reason for Europe to give us a good deal as they hope we will not leave and that will be so if we are harshly treated. What a shame Boris did not say he would resign and challenge for the leadership and that as European Parliament says we have not made enough progress we will just leave without a deal unless his sensible proposals are now accepted; what a pity Nigel Farage has not yet said he will form a new party and do a Macron and so have an election.